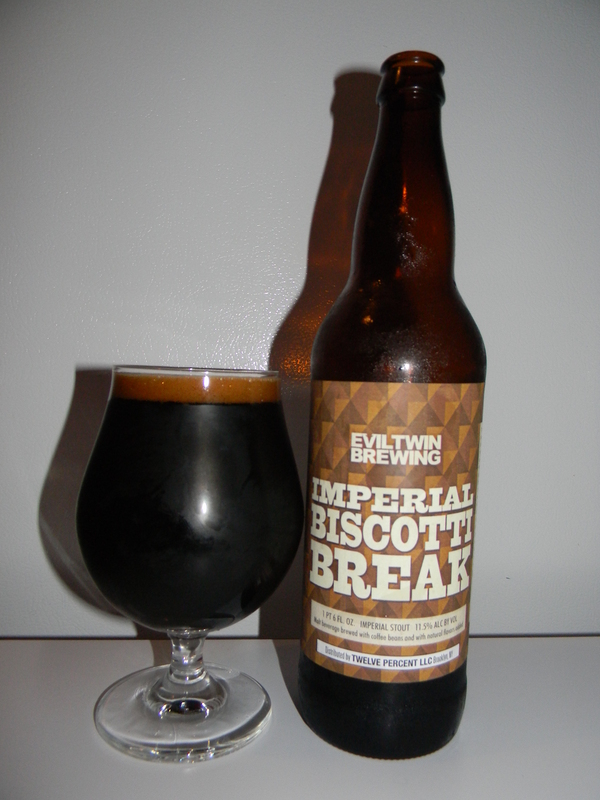 Review of Evil Twin Imperial Biscotti Break | Beer Apprentice - Craft Beer News, Reviews, Interviews and Info. I’ve had real good luck with the Evil Twin brews I’ve tried thus far, so I’m expecting this one to be no different. From the website, eviltwin.dk, I read this blip about the beer. The Roman Empire had a certain ‘je ne sais quoi’ – festive food culture, extravagant architecture and spectacular live entertainment. Some might argue the Emperors where brutal, mad and hungry for power, and the people vain when taking baths and working out all day. Listen – that’s still all part of the secret Imperial ingredient – keep it cool, clean, confident, arrogant and flamboyant. Forza Imperiale. Alright. Let’s sip this bad boy. This beer came in a 22 oz. bottle and it had an ABV of 11.5%. It poured black with no highlights. The head was very dark brown and small with a very easy pour. The texture was smooth, creamy, soft and dense. The retention time was more than solid, however the lacing was a touch thin, but consistent. That was surprising considering the tightly compacted bubbles. It did leave a solid amount of alcohol skims on the sides of the snifter though. The nose presented a nice roasted coffee bean tone. Some hints of oats, milk chocolate and a touch of vanilla. It also had a scent of caramel malt and doughy bread. This was a great smelling beer. It was complex and for being so high in alcohol I didn’t detect a strong aroma. The taste brought forth a nice coffee bean flavor. A relish of toasted bread crusts and chocolate really peaked my interests. It was slightly nutty too. It was a touch bitter, but in a good way. It was balanced well and I liked it. The mouthfeel was medium/full bodied. It was smooth, creamy, slick and chewy with just a notion of chalkiness. The carbonation was medium to low and a good shot of warmth was felt as it went down to the belly. A great deal of flavor was left behind after each sip too. Nice. This was a very good beer and a very good Stout in my opinion. Definitely a sipper, but perfect for those cool evenings during the Winter time. I’d love to pick this up again that’s for sure. And you guys should too if you see it. Be sure to leave a comment and tell me about your experience with the Evil Twin Imperial Biscotti Break if you try it. If you like those coffee/chocolate Stouts I have no doubt that you will like this one.